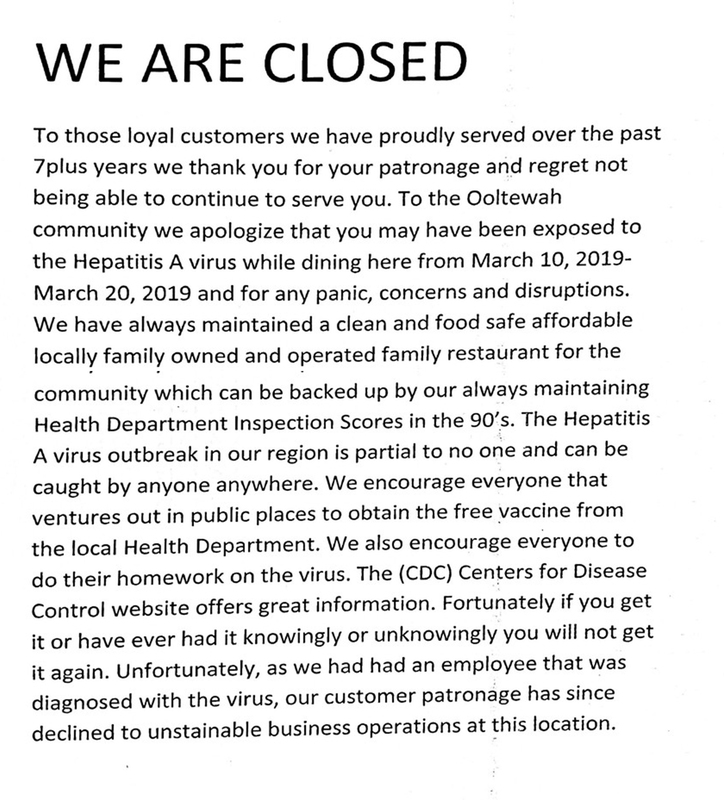 Ooltewah, Tenn. — A few weeks after an employee at the Western Sizzlin Restaurant in Ooltewah was diagnosed with Hepatitis A, that same restaurant is now closing its doors. Back in March, an employee at the 6021 Relocation Way location was diagnosed with Hepatitis A. A statement from the restaurant released Sunday afternoon confirmed the closing. In the statement, the restaurant claims they are closing due to decreased business after one of their employees was diagnosed with Hep A. The restaurant also apologized to those in the community who may have been exposed, and encourage those in the region to get vaccinated against the virus. WTVC NewsChannel 9 provides local news, weather forecasts, traffic updates, notices of events and items of interest in the community, sports and entertainment programming for Chattanooga and nearby towns and communities in the Tennessee Valley.